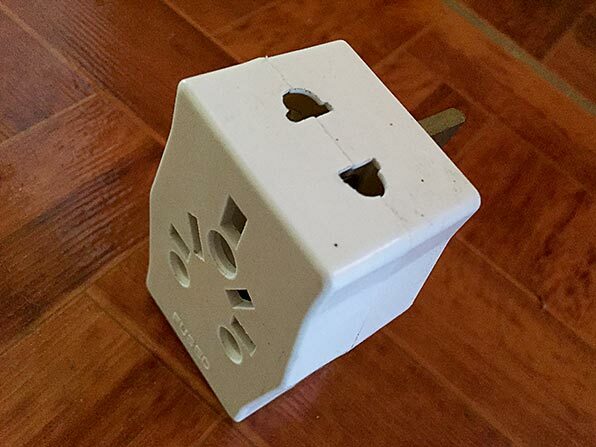 Being born and raised in Canada, when I think of AC (alternating current) electricity, the normal plugs that North Americans have in their houses, I typically only think of 110 Volts (or 115, or 120). I understand that in many other parts of the world, the norm is actually 220 V (230 – 240). As we travelled down the eastern coast of the United States, if we ever found ourselves in a position to stay on a dock, we had no trouble plugging in to shore power as they were all wired for 110 V. As boats get farther and farther south though, this changes. In Grenada for example, the biggest and nicest marina on the island, Port Louis Marina, has only one dock with 110 V electricity, the rest being 220 V. Conveniently, the house we’re staying in right now has both 110 V and 220 V receptacles on the walls. Working on ZTC in the yard, we’ve found ourselves having to purchase a couple of new tools. The first, a heat gun, could only be found in 110 V. Yesterday’s purchase, a shop vac, was only available in 220 V! Fortunately, the yard at Grenada Marine has both 110 and 220 outlets too. The problem we ran into yesterday was that the plug on our new vacuum was a different shape than the outlets available. And we didn’t determine that until we got to the boatyard. I guess that’s why they sell those little adapter plugs for travelers. Nothing is ever easy! Another trip to the hardware store was required to buy one of these! This voltage thing is something we have been thinking about lately because many of the boats that we’ve been looking at, Amels in particular, are European boats that are wired for 220. I used to think that that would be a disadvantage but outside of North America, I’m now of the opinion that it’s actually an advantage. Electrical people, feel free to voice your thoughts on the subject. Note: The real electrical challenge is not actually the voltage itself as it can be changed pretty easily via a transformer. The problem is the frequency of the AC electricity, 60 cycle (typical with 110 V) vs. 50 cycle (220 V), and that can not be easily changed. While some items are pretty forgiving, many appliances (motors, compressors, etc.) do not react well to being run at the improper frequency. Get off the boat and go for a walk. Previous PostWhat would you do if this happened to your daughter? Thanks, John. 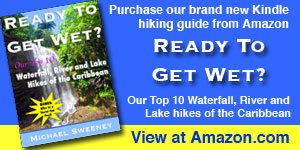 There are lots of reasons to buy an Amel! Keep in mind most all transformer type devices, laptop chargers, phone chargers and such will operate on 110V or 220V. They just need a proper adapter. Right. Just need to be careful with frequency sensitive devices like I said. Evenstar, a Hallberg-Rassy is a European boat with Euro power, and it IS much easier outside the U.S. The further you get abroad the easier it is. Of course, we have round two prong/one hole style European plugs. New Zealand (220/50) uses a two/three prong style with the blades at an angle. So we had to get new adapters even though the power is the same the plugs are different. 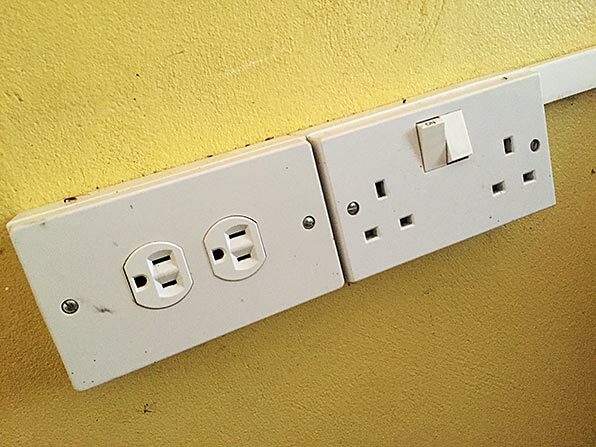 You also may find yourself cutting ends off of power cords for appliances to make the right permanent mate – NZ style plugs make things awkward for us for example. The shore power connectors seem to be mostly the same, though you CAN get by with smaller and cheaper shore power cables since the voltage and currents are lower. We had another issue with shore power cables though, as our boat had a surge suppressor on it. This worked with American style 220/50A shore power and was an addition by the prior owner in the U.S., but with the hot/ground/neutral arrangement of Euro 220 it kept blowing the breaker on the docks in Euro power land. We finally figured it out in Tahiti, we disconnected the surge suppressor and everything was fine. Since we were in the U.S. with the boat for years before cruising the 220V was a power and we had no native 110V on board. Small appliances like blenders and coffee makers were a problem and we cooked a few before I finally installed a 110V sine wave inverter with some U.S. plugs. It is WAY too easy to screw up the adapters and plug a 110V appliance into a 220V plug, especially with guests on board. Good luck – doing it over again I’d go with a 220V boat unless I was never leaving the U.S. I have a fairly good size bag full of various adapters, plugs, pig tails, etc. from our 30 years of cruising around the world and never seem to have the right one when we pull up to a new dock! We feed 220-240 volts through an isolation transformer so there are no reverse polarity issues. The 50 hertz can be an issue, mainly with our icemaker and microwave. I would go for a large enough inverter and use shore power (whatever available) to charge the batteries. IF the dock power matches my boat, then I would not use the inverter. A number of the good battery chargers will accept a wide variety of voltage and frequency inputs. Unfortunately, if the shore power input doesn’t match the appliances on board, you would need to use your inverter to power them, which for some things, like air conditioning, likely won’t work. 220v wiring on a boat can be thinner for say a 2400w load as it is only drawing 11 amps. The same load in a 110 volt system draws 20+ amps. This might bean issue if you want to convert a European boat to US AC gear. This might only matter for big stuff like heaters, hot water services and A/Cs. I think a friend of ours who purchased a new french-built cat but had it wired for the US (100V) attributed undersized wires to some of his electrical problems. We have a combination Magnum Inverter/Charger, but have found that it won’t accept either a 50Hz input or 220V. Its too smart for its own good. If I was to do it again, I’d have two devices, one to charge and one to invert. If you go with a 220 boat, you’d better have all your tools 220. If/when you haulout, you either use your onboard tools, buy more – or pay somebody to do the work. Think about it. When in Curacao last year, we connected on dock to 120V power, but 50 Hz. I bypassed the Magnum Inverter/Charger, moving hots and neutrals to a separate AC panel (that I cleverly installed years ago for this purpose). However, since the shore power was 50 Hz and not 60 Hz, I moved over only the water heater and battery charger (this is a separate, smaller charger, only 45A bought specially for out Li battery house bank). This way, I ran the inverter at the same time as the shore power connection. Now, we’re currently dockside in Tahiti and the power is 220V but 60 Hz. The rest of French Polynesia is 50 Hz but the island of Tahiti is 60 Hz. This time, I brought in the shore power through a 3000W transformer (that I cleverly installed years ago for this purpose), again bypassing the Magnum Inverter/Charger and moved the hot and neutrals over to this separate panel. It took two hours but its working fine, if you can accept that the voltage is only 107V and not 120V. By the way, I did a lot of research on this last year. If you’re concerned about electric motors designed for 60 Hz but running at 50 Hz, you should be – they get warm quicker and will burn out, but not in minutes – weeks. Therefore, don’t run them at full load — or feed them a lower voltage, even 95V is much better than 120V through a transformer. The motor (compressor, vacuum, drill etc) won’t heat up. Bottom line – world wide cruising takes some thinking and configuring to be able to accommodate voltage and frequency. Or… never plug in to shore power! What are your thoughts on your lithium battery setup, now that you’ve had a chance to live with it for some time? We’ve had the Lithionics batteries (two at 190Ahr each) for 2.5 years now and have no reservations at all. Simply put, we love them. Never plugging into shore power is a good idea. Stay away from air conditioning and you’ll be OK.
Nice to hear. Do you ever see those batteries becoming the norm, replacing the AGMs and Wet Cells that are more commonly used? The vast majority of simple consumer appliances use synchronous AC motors; in that case, the 1200 rpm motor will turn at 1000 rpm. Given similar voltages (stepped up/down with a transformer), the magnetic considerations really won’t matter as long as you don’t push the tool. Expecting the same performance from for example a heavily-worked sander, though, would be wrong; then take it easy running a North American appliance on 50 Hz. Our 60Hz -designed blender has made fine tropical drinks on 50 Hz; just took a little longer to hammer the pineapple into submission. Using an inverter solely to provide voltage/frequency conversion vs. a simple transformer is like using a (financial) sledgehammer to crack a walnut. A robust 2:1 transformer with good wiring on both primary and secondary sides, along with clever and well-labeled switch wiring, will give you the flexibility to run both types of appliances. Just take it easy. More complex high-power electronic appliances like microwaves might be less optimal. Most consumer entertainment (computers, audio, etc.) equipment is happy with either voltage or frequency nowadays. Thanks, Mike. Your info is appreciated. Forgot to add, as an extreme example, parts of Japan are 100V/50Hz. Our only (absolutely devastating) problem was when my daughter complained that her blow dryer left a lot to be desired as far as heat/pressure performance went. On the other hand, after flipping the voltage button on the wall wart they all seem to have nowadays, she even complained about European blow dryer performance as the fan didn’t blow like it did on 60 Hz. I’d never hesitate to buy a 220 V boat especially if planning to be outside North America. 50 vs 60 Hz can be an issue, but as we rarely plug-in it really hasn’t been an issue. Good luck hunting.